use all our facilities. We have a swimming pool, bar, guest lounge, satellite TV where you can relax and enjoy Real Spain. From the terrace of your accommodation you can sit and admire the fantastic views across the Orange Groves to the Mediterranean of Spain. Double en suite and Family room with double bed with private bathroom. A totally separate bar with lounge area, Satellite T.V. 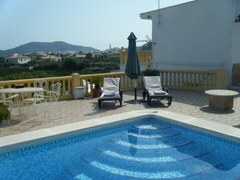 & terrace with stunning mountain & sea views and secluded swimming pool. 8 x 4m secluded pool. We have special plastic cups and glasses so drinks can be taken by the pool. There are 5 sun beds complete with cushions for our guests. For picnics by the pool there is a large oval table with 4 chairs available. There is also available a real lifeguard for women aged between 25-59. To find that quiet spot we have 3 terraces so you can follow the sun, or you can find that shady spot. Outside the guest lounge there is a large BBQ area and lawns, again with a large table and chairs – all for the use of our guests. We have no restrictions as we have very much a home from home policy. The T.V. / video room is fully stocked with numerous videos and music cd’s and a library for our guests to use. There are also tea and coffee making facilities at no extra charge. There is also a fully stocked fridge of wines, beers, spirits etc where again you can help yourself and make a note by writing on the drinks pad provided. The T.V. / video room is situated away from the main sleeping rooms so as not to disturb people who prefer an early night. We have some lovely walks in the area and bikes to use. airports, junction 61 on the main coastal motorway AP7/E15 in the picturesque village of La Font d'en Carros a village situated behind the larger towns of Oliva and Gandia. Our bed and breakfast Oliva is ideally pitioned not only for that relaxing holiday but all house hunters, where local knowledge can be obtained free of charge.